A riad is the classic place to stay if you’re visiting Morocco. In these traditional buildings the rooms face inwards onto a central courtyard with a roof terrace up above. But although the structure might be fairly standard, they come in all shapes and sizes, from simple to ultra-luxe. I stayed in a few very nice riads on my last trip to Morocco, I’ve have found a new favourite in Essaouira’s Riad Dar Maya. On first look it could be a traditional riad, but was actually built a few years back by British owner Gareth. The site was derelict so he got to start from scratch to create a place that combines traditional design with modern comfort and facilities. So you get the good bits of a riad (roof terrace, courtyard fountains, arched doors) without the bad (coldness in winter, a fondness for bathrooms without doors!). It was a totally relaxing place to escape the British winter for a few days and the perfect start to a Moroccan mini-honeymoon. 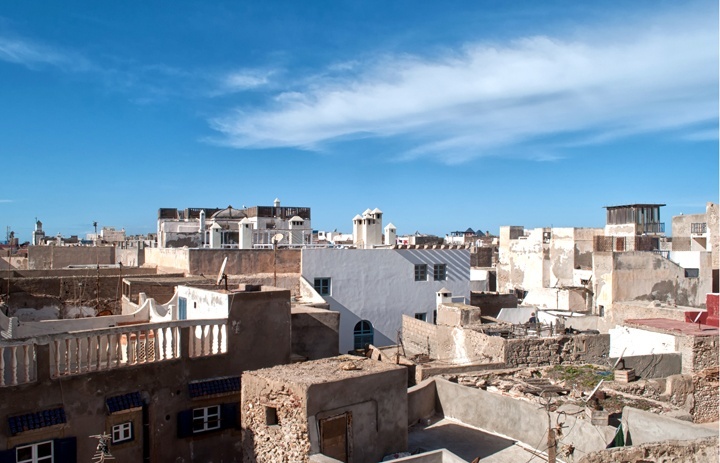 The riad is right in the midst of Essaouira’s medina – the narrow maze of streets enclosed by city walls that makes up the old part of many North African cities. The entrance is a wooden doorway tucked into a side street by the city walls. You’re close enough to hear the sea crashing against the rocks and have far-reaching views of the sea and across the medina from the rooftop terrace. The medina in Essaouira is smaller and easier to navigate than in Marrakech, so you’re not so likely to get lost, and there’s also a lot less hassle in the souks. There’s plenty of things to do in Essaouira, from cookery classes and visits to argan oil producers, to kite surfing or horse riding and quad biking on the wide sandy beach. Gareth is happy to provide suggestions of places to eat and things to do, and make bookings for you. The riad only has five rooms, spread over three different floors. We couldn’t get the same room for our whole four-night stay so started off in the Akshood room, one of the slightly smaller standard rooms, before moving to the Akal room for the last night. 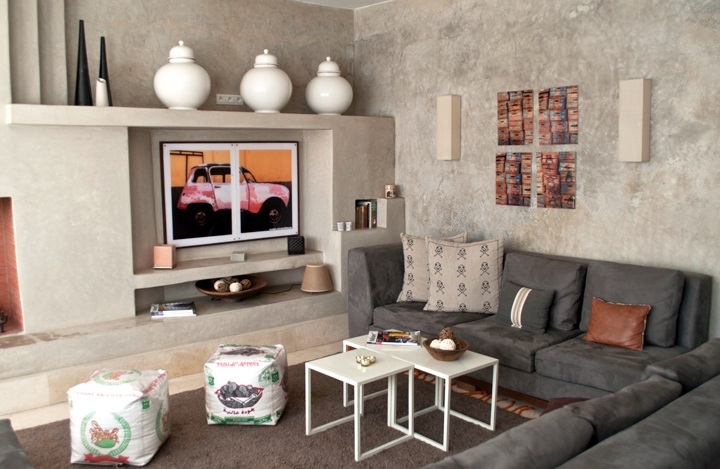 Both rooms were spacious and decorated in muted tones using the traditional tadelakt polished plaster. They had open fireplaces and seating areas, and the slightly larger Akal room also had a small balcony. 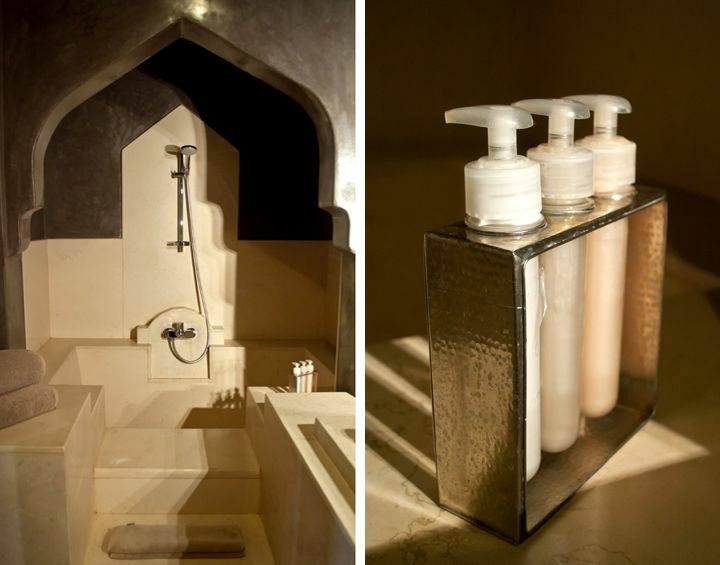 Bathrooms are built from marble, with underfloor heating and deep baths – the one in the Akal room was particularly palatial. There were lots of nice touches like fresh flowers, fluffy robes (in two different sizes so I wasn’t swamped by a man-sized one) and spa toiletries, plus modern conveniences like wifi, good hairdryers and lots of plug sockets. Breakfast is included with your room rate and you can have it whenever and wherever you like. You get fresh fruit and orange juice, a selection of pastries and pancakes, bread and eggs cooked to order. There is also good coffee and English tea if you fancy a change from the traditional Moroccan mint version. Dinner can also be provided with a bit of notice – let them know what you would like to eat and they can arrange for it to be cooked for you. We had a chicken tagine with preserved lemon and olives, along with a Moroccan salad and a fruit dessert. You can eat in the dining room or on the roof terrace, but we had a table set up in the candlelit lounge. A three course dinner cost 180 MAD (£13) per person. The riad is also licensed so you can get beers or wine by the glass or bottle. 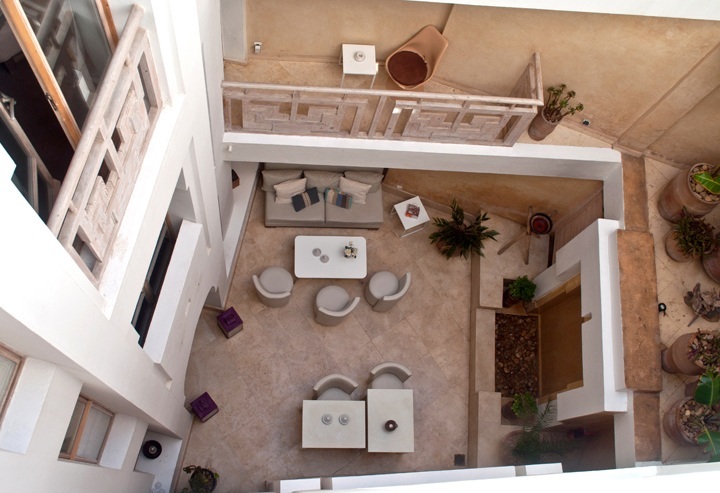 As well as your room there are also plenty of communal spaces in the riad to relax in. On the ground floor there is a courtyard with fountain and a dining room, then on the third floor is a lounge with comfy sofas and fireplace. It also has a small library, computer and iPod dock available for guests to use. 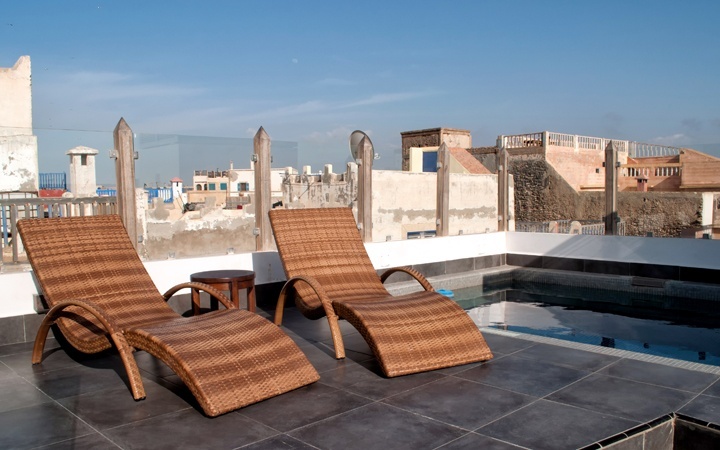 Then up another floor is my favourite bit of a riad – the roof terrace. This one is a beauty, with a small heated dip pool surrounded by glass walls to make the most of the views of the sea and across the medina rooftops. There are a couple of sunloungers and plenty of other seating, with a canopy for a bit of shade. Dar Maya also has its own small hamman where you can arrange to be scrubbed and steamed clean (a hamman followed by one-hour massage costs 500 MAD/£37 per person). Guests are… mainly European couples, we had French, Germans and Brits there along with us. Don’t forget… your swimming costume to make use of the roof terrace dip pool. Useful to know… there’s only two sunloungers so grab one early if you want to do a bit of sunbathing by the pool. Rooms at Riad Dar Maya cost €120 a night for the two standard rooms (Amane and Akshood) and €145 a night for the three rooms with balconies (Akal, Laafit and Tiggna). There’s a 20% supplement over the Christmas/New Year period and during the Gnaoua music festival in June. 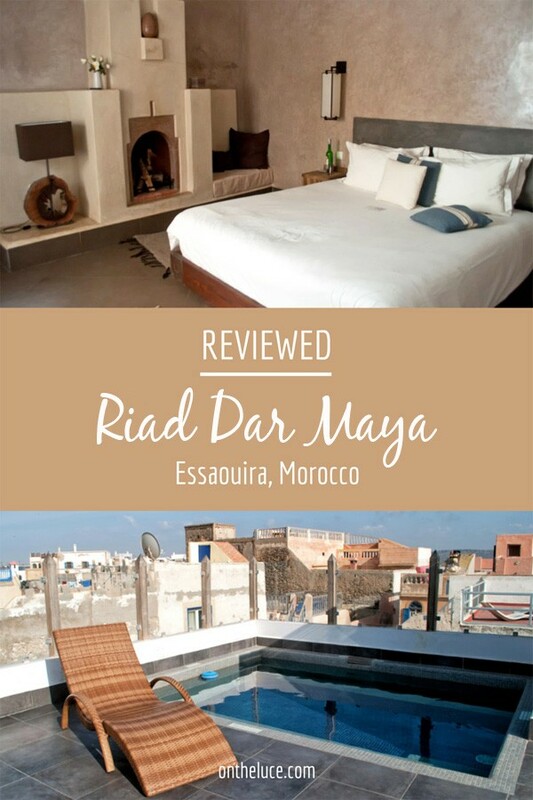 You can also book the whole riad for a group of ten people from €605 a night (I quite fancy this for next winter!). Definitely – highly recommend it for a relaxing break. 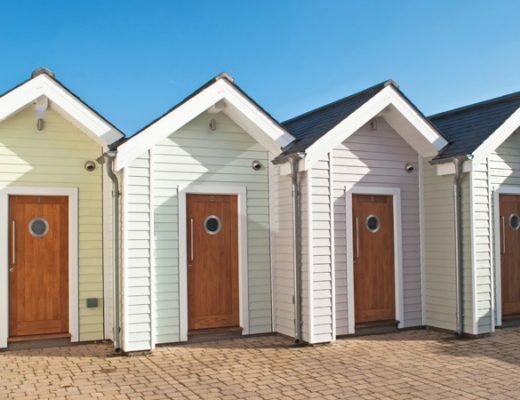 This accommodation is gorgeous and it looks so peaceful and relaxing – especially that bathroom. It was so relaxing – we spent four nights there but I could easily have managed a week! Looks wonderful. 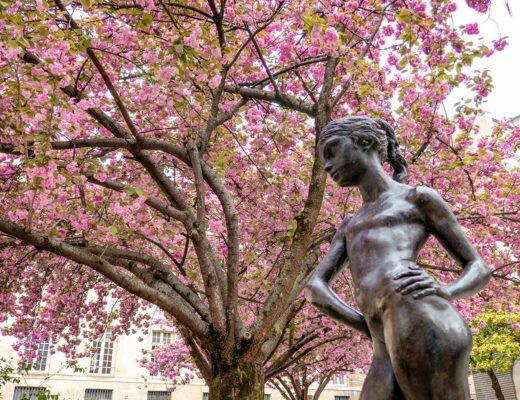 When is best time/weather to visit? 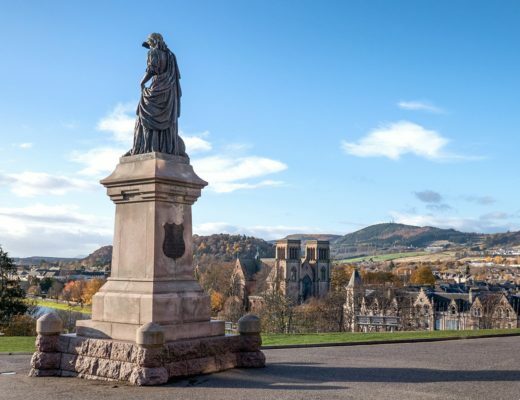 The climate is pretty steady all year – in winter it’s max 17 degrees then up to 23 in summer (the coastal breeze keeps the heat down), there’s a bit more rain in winter but not a lot, they have 300 days of sunshine a year! My my what a lovely place! I love how comfy that lounge looks and I wouldn’t mind dining at that roof top every day! 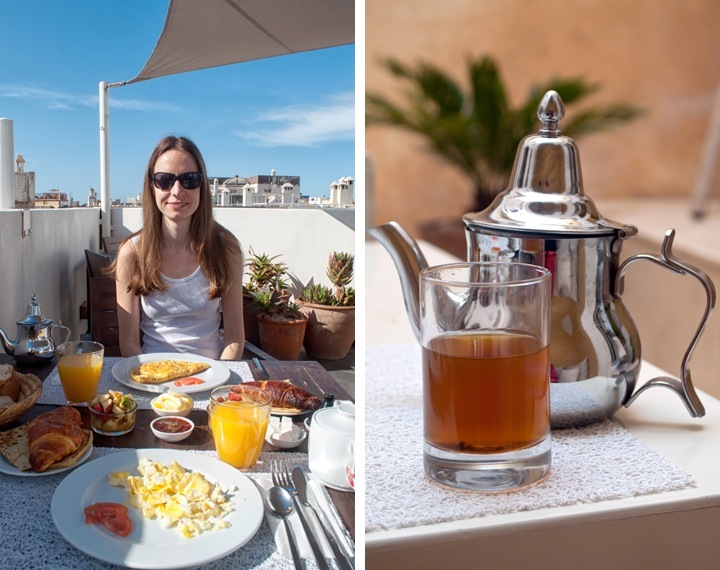 The rooftop was great for breakfast – though you did have to watch out for the seagulls coming to steal it! Looks delightful though perhaps lacking the wonderful hot Moroccan colours I’d expect. A nice place for a winter break. 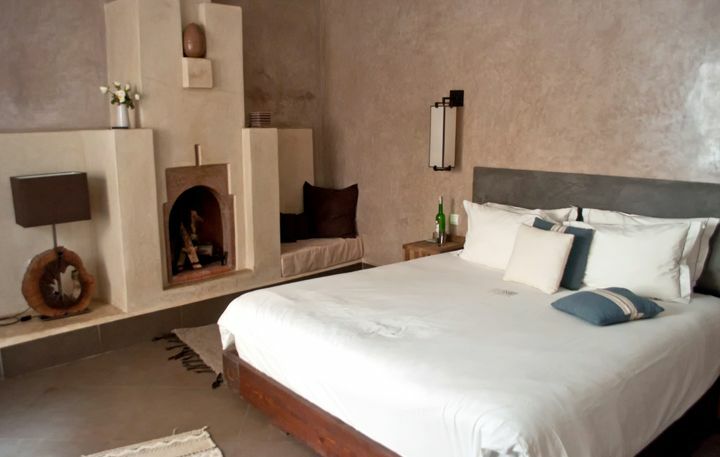 Yes this was much more calming muted colours, the place I stayed in Marrakech (review to come!) was a lot more traditional, with the reds and the green and blue tiles. Nice to have a contrast! It looks like a lovely place, the riad I stayed in in Marrakesh was… more traditional, and not necessarily in a good way! They do vary a lot! When I went to Morocco last time the places I stayed were a lot more traditional and some not in a good way either! Beautiful, I love all the stone work and neutral colours. 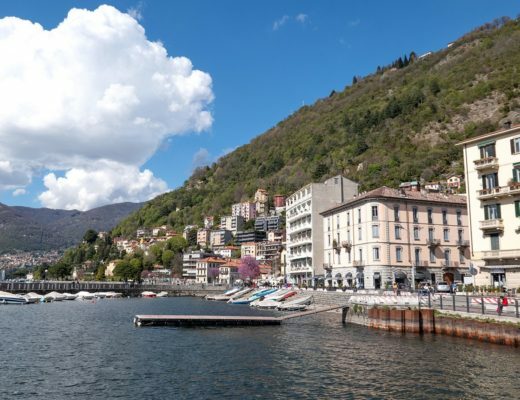 What a perfect place to stay on your mini-moon. Thanks Maddie, it was definitely the perfect place for a honeymoon, so tranquil and relaxing. I really love the style of riads, so peaceful as you look in towards that central courtyard. Oh, I love this! I have been dying to go to Morocco for a while now. Staying at a riad there is my top priority. Really enjoyed the review! There are some fantastic riads, though such a huge choice it can be tough to choose which one to stay in! What a fab find and I love the idea of taking the whole place over with a group of friends. Thanks, yes I’d love to do that next year – it would be like a very posh house party! Yes there’s definitely something of the faded seaside town that reminds me of childhood holidays at home, plus an twist of the exotic, it works well though! Sounds just up my street. 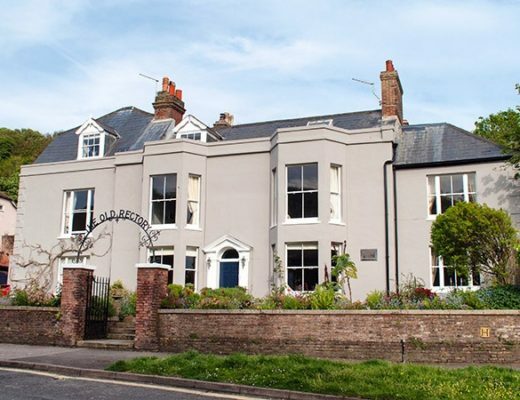 A gorgeous location with service and attention to match. Nice one! 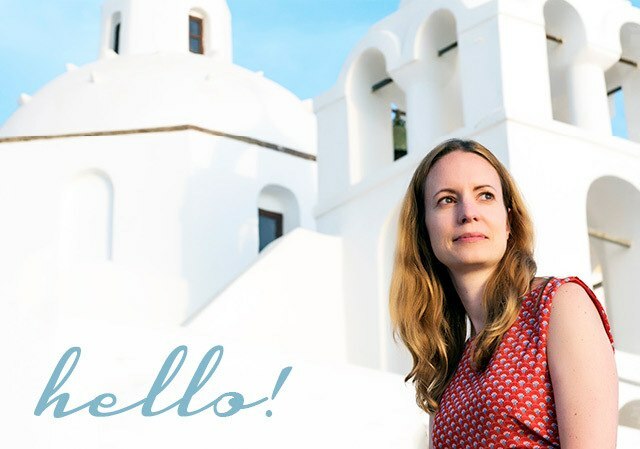 It was just fantastic – great service but not intrusive and luxurious without being snobby, one I’ll be back to for sure!